PITTSBURGH (AP) — The Pittsburgh Penguins gained a measure of revenge against a rival that ended their season last spring. Kris Letang scored his second goal 1:20 into overtime and the Penguins opened theseason with a 7-6 victory over the Stanley Cup champion Washington Capitals on Thursday night. Penguins coach Mike Sullivan believes the three-point opener will give Letang confidence moving forward. Jake Guentzel also scored twice, Evgeni Malkin had a goal and two assists, and Derick Brassard and Jamie Oleksiak added goals in Pittsburgh’s opener. Matt Murray made 30 saves. T.J. Oshie scored twice for Stanley Cup champion Washington, coming off a 7-0 home victory over Boston on Wednesday night in the Capitals’ opener. Alex Ovechkin had his second of the season and 609th overall, passing Dino Ciccarelli for 18th on the NHL list. Brooks Orpik scored his first goal in 182 regular-season games. Jakub Vrana and John Carlson also scored. Holtby made 34 saves. The Capitals met the Penguins for the first time since eliminating Pittsburgh in six games during the second round of the Stanley Cup playoffs. The winner of Pittsburgh and Washington’s second- round series the past three playoffs has gone on to win the Stanley Cup, including the Capitals’ first-ever championship last season. During the previous three seasons, the Penguins and Capitals met 32 times in the regular season and playoffs with 16 of those 32 games decided by one goal. The Capitals return 20 of 22 players who won the Stanley Cup, while Pittsburgh seeks its third championship in four seasons with a lineup largely unchanged from last season. Five of the first seven shots were goals as the Capitals held a 3-2 lead eight minutes into the game. Both teams scored in the first four minutes of the second, but Pittsburgh closed the period with goals from Guentzel and Brassard scored less than two minutes apart, giving the Penguins a one-goal lead going into the third. NOTES: This is the second time in the past three years Pittsburgh opened its season with Washington. Pittsburgh is 6-0 against Washington in season openers. … D Jack Johnson played his first game for Pittsburgh after signing as a free agent for five years and $16.25 million on July 1. .. Ovechkin is one goal behind Bobby Hull for 17th. … Orpik’s last regular-season goal came Feb. 26, 2016, against Minnesota. Capitals: Host Vegas on Wednesday night. 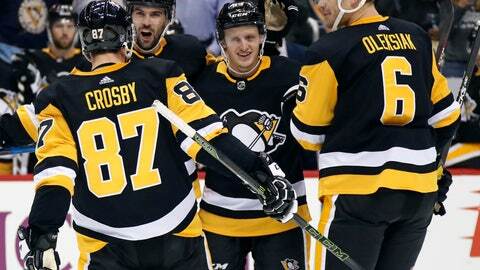 Penguins: Host Montreal on Saturday night.